Write down the name of default view in a PowerPoint presentation. By default, a presentation screen is always shown in Normal view. Differentiate between a presentation and a slide. A presentation is a set of slides that you present to people in a group while each page of a PowerPoint presentation is called a slide. Name two ways where you can create a presentation. You can create a presentation under Normal view and Outline view. Write use of layouts in PowerPoint. Layouts are used to define the layout of the slide, i.e. the placement of title, subtitle, components of slide etc. In PowerPoint 2007 under the Insert tab, there is a button named Text Box. What is the utility of this button? Like a title placeholder, a Text Box is used to hold the text information. Is it possible to change the background of a slide at some later point of time? Yes, we can change the background of a slide at any point of time. Can graphics be inserted into the slide? Yes, we can insert pictures, graphs, charts, SmartArt etc., into a slide. Animation is a feature, which you can use in your presentation. What is the purpose of this feature? Animations are the visual effects applied to individual items on a slide such as graphics, titles or bullet points, rather than to the slide itself. Kirti wants to add sound to slide transition. Which feature of Animations tab is useful for this purpose? On the Animations tab in the Transition to This Slide group, click the arrow next to ‘Transition Sound’ to add sound to slide transition. Explain an advantage of grouping objects in PowerPoint. The grouped objects can move, transform, resize and also can change the properties of all the objects in a group together. What is the use of Enter and Esc key in a Slide Show? Press Enter to move to the next slide and Esc to close the Slide Show. Name any four basic elements of a slide. How many views of a slide PowerPoint provided? State three functions of the Slides Pane. Three functions of the Slides Pane are as follows: . New slides may be added to the presentation. Allows marking a slide as hidden for not showing it during a slide show. Deleting a slide from the presentation in case it is no longer needed. Write three functions that can be performed in Slide Sorter view of a presentation. We can see the entire presentation. We can move slide from one place to another using click-drag method. Also, we can rearrange the order of slides. We can insert, rename and delete slides. How are Header and Footer useful? Header and Footer are very useful for displaying the similar useful information on each slide. One can change the Header and Footer details at any time in the presentation. Write the steps of inserting picture in a slide. Pictures and ClipArt can be inserted into a Microsoft Office PowerPoint 2007 presentation from sources such as ClipArt Website providers, Web pages or files on a computer. These pictures can be used as backgrounds for slides in a presentation. Here, we will discuss inserting pictures from files only, as per syllabus restrictions. Click where you want to insert the picture. On the Insert tab, in the Illustrations group, click Picture option. Locate the picture that you want to insert and then double-click it. To add multiple pictures, press and hold Ctrl key while you click the pictures that you want to insert and then click Insert button. To insert a picture into the notes pages of an Office PowerPoint 2007 presentation, switch to Notes view and then do the above same procedure. A sales manager creates a presentation he add the same slide transition to all the slide. Write steps, which are followed by sales manager for slide transition? Points can be revealed on slides in a staggered way (i.e. one bullet displayed at a time) to keep the audience focused only on the point which is being discussed at the given time. Also, the presentation can be automated, so it runs on its own. What can you do if you want each slide should be shown for a specific amount of time? Setting advance slide to one mouse click is the default and a simple setting. If you want each slide to be shown for a specific amount of time, click automatically after and enter the number of seconds. Click Apply to All slides. Differentiate between Slide Transition and Custom Animation. Slide transitions are the looks that take you from one slide to the next. Custom Animations are the movements you put on text, pictures, objects on an individual slide. Slide transitions apply to slides themselves. Custom Animations are applied to objects on a slide. What are the different ways in which you can start creating a new presentation? Write steps for each. Click on Office button and then click New from the menu that appears. A New Presentation dialog box will appear. Select Blank Presentation and click on Create button. A blank presentation with one slide will be created. Also, further slides can be added to the presentation and can change the layout of an existing slide as well. You can quickly and easily format an entire presentation to give it a professional and modern look by applying a theme. Click on Office button and then, click New from the menu that appears. 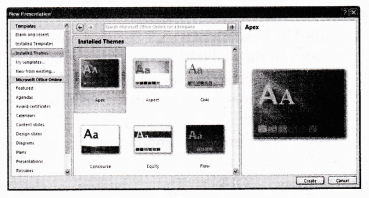 From the right hand side page, select Installed Themes under Templates. Select any one of the theme as per the users choice. Select Design tab under the MS-PowerPoint 2007 ribbon menu system. Select Themes group under this tab. Select any one theme as per the choice. Effects will be automatically applied on all the slides. Click on the Microsoft Office button and then, click Save As option from the menu that appear. Save As dialog box will appear, in the File name box, enter a new name to save the file. Explain the various views of a slide available in PowerPoint 2007. On the View tab, in the Presentation Views group, where all views are available. Normal View: This is the main editing view, where you write and design your presentations, i.e. actual screen which is displayed. The view is also known as Slide view. A Normal view is the default view size for the screen. Slide Sorter View: It provides a view of slides in thumbnail form. This view makes it easy to sort and organize the sequence of the slides at the time of creating presentation and also, at the time of preparing presentation for printing. Notes Page View: In the Notes Page view, the notes pane is located just below the slide pane. Here, notes that apply to the current slide can be typed. Later, these notes can be printed and referred while giving actual presentation. Notes can also be printed to handout to the audience or included in a presentation that is delivered to the audience or posted on a Web page. Slide Show View: This is used to deliver a presentation to the audience. Slide Show view takes up the full computer screen, like an actual presentation. In this view, you can see your presentation, the way audience wants. This view enables you to see how graphics, timings, movies, animated effects and transition effects will look during the actual presentation. To exit Slide Show view, press Esc key from the keyboard. Master View: The Master views include Slide view, Handout view and Notes view. They are the main slides that store information about the presentation, including background color, fonts effects, placeholder sizes and positions. The key benefit to working in a Master view is that on the Slide Master, Notes Master, or Handout Master, you can make universal style changes to every slide, notes page, or handout associated with the presentation. Which tab and command let you insert animations in your slide? 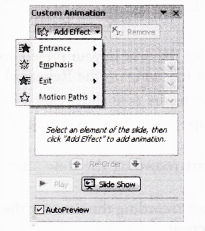 Write the steps for applying animations in your presentation. On the Animations tab, in the Animations group, select the animation effect that you want from the Animate list. On the Animations tab, in the Animations group, click Custom Animation. To make the enter text or object with an effect, point to Entrance and then click any effect. To add an effect, such as a Spin effect, to text or an object that is already visible on the slide, point to Emphasis and then click an effect. To add an effect that makes text or an object leave the slide at some point, click to Exit and then click an effect. To add an effect that makes text or an object move in a specified pattern, click to Motion Paths and then click a path. Animation list and then click Effect Options. To specify settings for text, on the Effect, Timing and tabs, click the options Animate text from Effect tab to use to animate the text. To specify settings for an object, on the Effect and Timing tabs, click the options that you want to use to animate the object. Effects appear in the Custom Animation list in the order that you add them. Write the steps to print handouts in PowerPoint presentation. We have already studied about the handouts view of presentation, it could help the audience in getting idea of your’s easily. A presentation can be printed in the form of handouts-with one, two, three, four, six or nine slides on a page. Click the Microsoft Office button, click the arrow next to Print option and then click Print Preview. In the Page Setup group, click the arrow under Print What: and then select the handout layout option that you want from the list. To specify the page orientation, click the arrow under Orientation and .then click Landscape or Portrait. Complete the blank spaces using words from the list. You should use each word only once. Websites, slide, PowerPoint, presentation, templates, handouts, projector. MS (1)………………… is a (2)………………… program that lets you make and show slide shows. These can be viewed on the computer screen or through a multimedia (3)………………… Copies of the presentation, called (4)………………… that can be printed out and given to the audience so that, they can make their own notes. Presentations are made up of a series of pages, called (5)………………… as well as text, slides may incorporate graphics, animated images , sounds and video clips, graphs, charts and even links to (6)………………… Most presentation packages provide a set of themes and (7)………………… which make it easy to create professional looking presentations with little skill or knowledge. They also offer the facility to add slide transition, timing and animations, which bring a presentation’s to life. Seema wants to give identical design to all the slides and handouts, she is going to print from her presentation. Which two methods can she use to accomplish her task? Compare the two methods and in list their differences. Creating same design on each slide and handouts manually. Using slide master and handout master. In the first method , the efforts are increased by many efforts and many errors in design may creep in. The second method ensures reduce efforts and identical design on each slide and handout. Ketan is preparing a presentation for his new product promotion. The content is ready but he has no time to design backgrounds and decide on color scheme for the presentation. Name the features that will help him to create a professional presentation without devoting much time. He wants to set how a slide appears and disappears on screen when he runs the slide show. Which feature should he use? He has to take with the help of master pages from taskpane to set a suitable background which supports descent color background. He must have to set some slide transition and custom animation effect from taskpane. Suman is working as marketing manager in an advertising company. She has prepared a presentation on her latest product. What feature will be used for the following tasks? To view all slides together. To set timings of the slide show while rehearsing. To show the sales using a chart. Press the Slide Sorter view button in work space area to view all the slides together. In the Slide Transition page, set the timing in Advance slide sections Automatically after position where the slide will automatically play after a speculated time period. In the layouts of tasks pane, select a chart type slide or use Insert —> Chart menu option. Add the company’s logo on the first slide. Add audio to explain the content of the slide. Connect slide 2 to slide 7 directly. Add date and time on all slides. ………………. is the default file name for a PowerPoint presentation. (c) The default name given to a presentation file is Presen tationl. File extension for a PowerPoint 2007 presentation is ………………. (b) .pptx is the file extension given to all PowerPoint 2007 files. The custom animation can apply ………………. (d) The custom animation can apply font work gallery, gallery and text. Professional looking visual aids are prepared with the help of software called ………………. (d) Professional looking visual aids are prepared with the help of software called Presentation graphics software. A set of predefined formats of text or color scheme is called ………………. (c) A set of predefined formats of text or color scheme is called theme. Which of the following view is useful for representing the structure of a presentation? (b) Outline view is useful for checking the flow or structure of a presentation. The entire presentation can be seen at a time in ………………. (d) Slide Sorter view enables you to view the entire presentation at a time. Which among the following views allows you to give a thumbnail view of all the slides in a presentation? Which among the following views allows you to add some extra information to a slide which is not viewed during the presentation. (c) Notes Page view allows you to add some extra information related to presentation but it is not viewed during the presentation. (d) .jpg and .gif are file extensions for images and .wav is an extension for video file. Hence, all these formats are supported in PowerPoint. Rama is preparing a presentation on her company’s annual performance. She wants some text present on a slide to fly in from the left, when she clicks the mouse. Which of the following features should she use? (c) Custom Animation can be used for the desired functionality. Special effects used to introduce slides in a presentation are ………………. (a) Special effects used to introduce slides in a presentation are known as transitions. Rehearse Timings command is present on ………………. tab. (c) Rehearse Timings command is present on Slide Show tab. Set new timing, while rehearsing ……………… key is press. (b) T key is used to set new timing while rehearsing. What is the shortcut key to display the Microsoft PowerPoint shortcut menu? (c) Shift + F10 is the shortcut key to display the PowerPoint shortcut menu. ………………. is a presentation graphics software. An electronic page in a presentation is called ………………..
A ………………. is a pre-designed format of text and color scheme. ………………. provides a command to change the layout of your slide. New Slide button for inserting a new slide can be found on ………………. tab. A ………………. is a box with a dotted outline, designed for the placement of different type of content on the slide. From ………………. page, it is possible for you to choose slide designs. In ………………. view, you can see all the slides in a presentation concurrently. To select slides at discrete order in the Slides Pane you need hold the ………………. on the keyboard while selecting the slides. ………………. is a special effect that allows to specify how to navigate from one slide to other. The ………………. Animation enhance uses the flying effect on the text and character. The Custom Animation command is present on ………………. tab. Every presentation can contain only one single slide. False A presentation is a collection of multiple slides. Changing a slide layout is not allowed in PowerPoint. False Under Home tab by clicking at Layout button, you can change layout of a slide. Microsoft Office button contains options for frequently used tasks, such as opening, saving and printing. True Open, Save, Save As, Print are frequently used tasks that are available on Microsoft Office button menu. We cannot insert audio recording sound in a slide. False We can insert audio recording sound in a slide. Objects on the slide that hold text are called placeholder. True Placeholders hold the text, ClipArt, charts etc. We can delete slides in Slide Sorter view. False Use this view to work with a group of slides or with only one slide. Special effects used to introduce slides in a presentation are called transitions. True Special effects used to introduce slides in a presentation are called transitions. To change the slides during the Slide Show is called Animation. True Animation can be used to changes in slides during the Slide Show. F4 key is used to start a Slide Show. False F5 key is used to start a Slide Show.